An estimated 80,000 diesel trucks emitting toxic fumes pass each night through the city, which has been adjudged the most polluted metro in the world. The project, sources said, is held up due to a dispute between the Centre and the state government over payment terms for meeting increased expenses for land acquisition. Six months since the Supreme Court rapped the National Highways Authority of India (NHAI) and directed it to expedite the execution of the Eastern Peripheral Expressway (EPE) — one of the two crucial projects conceived nearly a decade back for decongesting roads in the national capital — the Centre is yet to accord approval for the same. The proposal of the Ministry of Road Transport and Highways (MoRTH) for the Rs 6,000-crore EPE is pending with the Cabinet since March 2015. “We have received the bids. The orders, in seven packages, would be placed as soon as the Cabinet approval comes through,” a senior ministry official told The Indian Express. The project, sources said, is held up due to a dispute between the Centre and the state government over payment terms for meeting increased expenses for land acquisition. The Delhi government has doled out Rs 653.5 crore till date as against a revised demand for a total of Rs 1,794.8 crore. The Haryana government has paid Rs 327 crore and is required to shell out Rs 570.6 crore more as per the revised project cost. The Centre is concerned if the Delhi government’s demand for financial relief for execution of the expressway is conceded to, Haryana may come up with a similar petition. In the meantime, the NHAI has been asked to go flat-out and ensure the project is completed in the next three years as soon as the Cabinet nod comes through. The urgency for executing this vital link stems from mounting concerns over heavy vehicular traffic that passes through the city in absence of the peripheral roads and comes in the wake of a January 2015 directive of a three-judge Supreme Court bench that ordered NHAI to wrap up the project on or before July 30, 2018. An estimated 80,000 diesel trucks emitting toxic fumes pass each night through the city, which has been adjudged the most polluted metro in the world. Vehicular pollution in Delhi has reached record levels with respirable suspended particulate matter at 316 micrograms per cubic metre, almost 16 times of what is normal. According to the NCR Planning Board, about 6.4 million tonnes of cargo traffic will be transported in the region by 2032; the number of person trips will increase to 13.2 million in the same period. 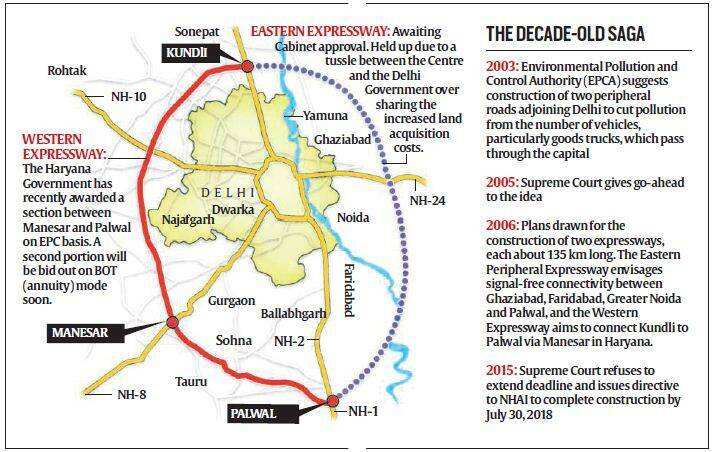 The apex court had ordered the construction of two peripheral highways, the eastern and western peripheral expressways, to decongest and reduce pollution in the capital 10 years back, on February 11, 2005. The Western Peripheral Expressway (WPE), which is being executed by the Haryana government, is about 70 per cent complete. It is only recently that work has again resumed on the stretch (WPE) with the Haryana awarding one portion between Manesar-Palwal to a contractor on item rate or EPC (engineering, procurement and construction) basis; tenders have been invited for the second portion on BOT (build, operate and transfer- annuity) model. A environment ministry official said, “Expediting construction of the western and eastern peripheral e-ways is crucial to reducing pollution in Delhi-NCR. The Haryana government has awarded one section on WPE, which should be ready sometime in 2016. A second section too is being readied for award.” The EPE can take off once the Centre gives its go-ahead. The EPE has been stuck since 2007, notwithstanding several attempts by the NHAI to offer stretches to private players for execution of the project and the earlier UPA government having even set a deadline to award this project by December 31, 2013.